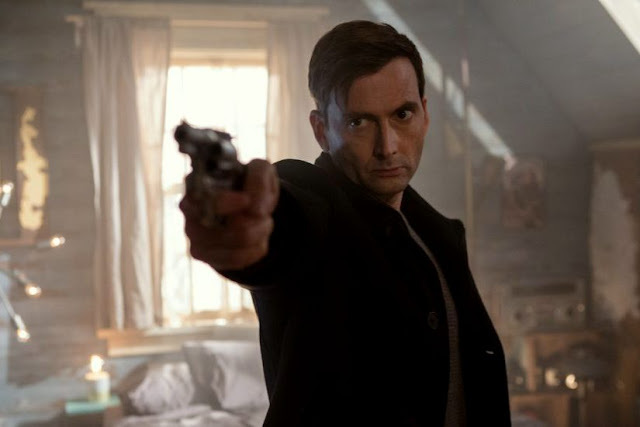 The new David Tennant thriller Bad Samaritan will be screened in seven cities across Germany in September as part of The Fantasy Filmfest 2018. The event runs between September 5th - 30th with an international programme of sci-fi and horror movies running in Berlin, Munich, Hamburg, Cologne, Frankfurt, Stuttgart and Nuremberg. Bad Samaritan stars David Tennant as Cale Erendreich, a seemingly normal successful businessman whose dark secret is uncovered by would-be burglar Sean Falco, played by Robert Sheehan. When Sean breaks into Cale's house he discovers a young woman there who has been abducted and tortured. He flees and calls the police who find nothing suspicious. Cale's gaze is now fixed on Sean and s deadly game of cat-and-mouse commences. Bad Samaritan was dircted and produced by Dean Devlin and co-stars Kerry Condon, Jacqueline Byers and Carlito Olivero.